Covers all aspects of diagnostic microbiology, including bacteriology, virology, mycology and parasitology. New to this ninth edition is up-to-date coverage of Streptococcus, Staphylococcus, multiple drug-resistant tuberculosis, gram-negative rods, Mycobacterium haemophilum, and Rochalimaea. 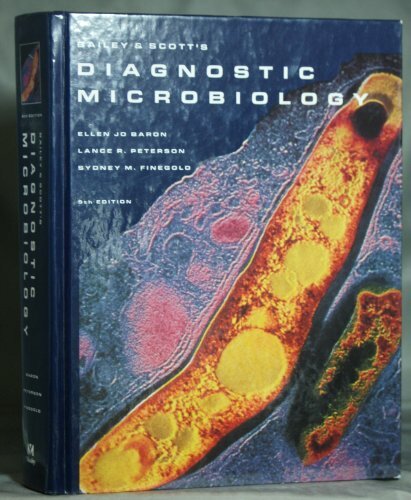 This text covers all aspects of diagnostic microbiology, including bacteriology, virology, mycology and parasitology. New to this ninth edition is up-to-date coverage of Streptococcus, Staphylococcus, multiple drug-resistant tuberculosis, gram-negative rods, Mycobacterium haemophilum, and Rochalimaea. A new chapter on the role of the microbiologist in medical practice identifies the microbiologist's responsibilities within the medical team, with regard to: specimen collection; examination of tissue; designing appropriate test requisition forms; defining rejection criteria for specimens; deciding what is clinically relevant in terms of specimen processing, culturing, identification and susceptibility testing; and implementing cost-saving strategies in the laboratory.